Franklin held a small but exclusive party in New York City ahead of her birthday on Tuesday, with Washington entering the Ritz-Carlton Hotel venue disguised under a baseball cap. 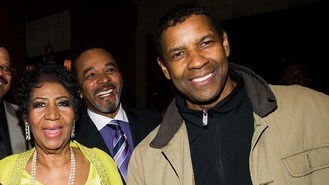 Franklin thanked the Oscar-winning actor for attending, which came just hours after she watched him on stage in the Broadway play A Raisin In The Sun. The singer was all smiles at the event, and enjoyed a three-tiered cake to mark the occasion. She said in an interview that she is working on new music with rapper Andre 3000 and singer-songwriter Babyface. When asked what she wants for her birthday, the queen of soul said. "I'm looking for a record deal for my granddaughter Victorie, and my son Kecalf." They both performed recently at the BET Honors special, which paid tribute to Franklin. "I would be happy with that," she said.